June 21, 2016 – A test version of the European Service Module is at NASA’s Plum Brook Station in Sandusky, Ohio, USA. ESA’s module will power NASA’s Orion spacecraft into deep space, providing propulsion, electricity, water, oxygen and nitrogen and thermal control. This test article has the same structure and weight as the real thing but does not include the electronics and engines. It is being used to confirm the design before the actual flight version is built. From a design perspective, the launch is one of the most demanding moments in a mission. Orion will sit atop the Space Launch System and more than 2500 tons of propellant. The vibrations and forces are intense until they reach the relative calm of space. To ensure the service module can withstand these forces, it is placed on a large table that shakes and moves to recreate the vibrations of launch. Almost 1000 sensors monitor how the 35 ton spacecraft flexes and withstands the stress. 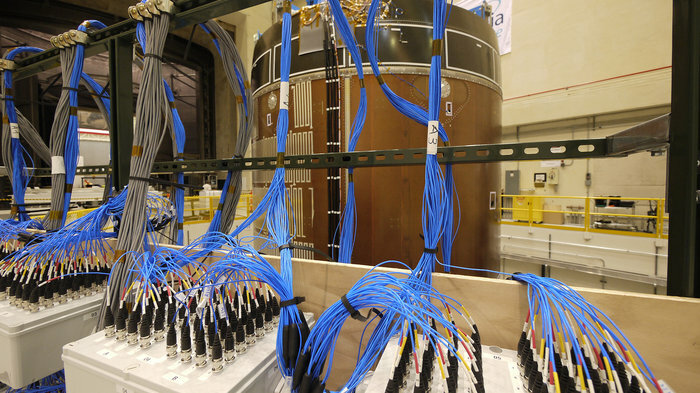 The blue wires carry the data during the tests for later analysis. The tests are running smoothly and the first flight model is being built in Bremen, Germany. It will be shipped to the U.S. next year for more testing and final integration ahead of Exploration Mission-1 at the end of 2018.